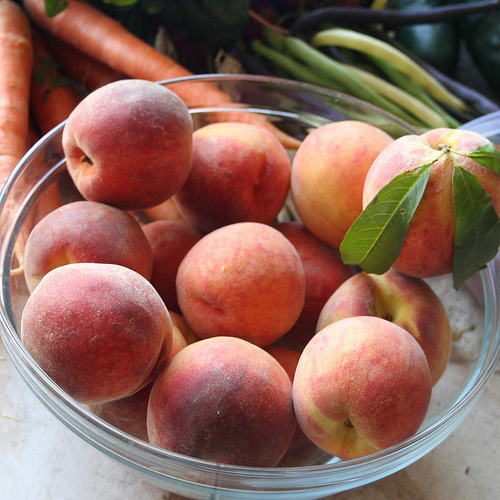 Andy McIndoe's Designer's Diary: Peaches on the Patio, nectarines too! Blueberries have become deservedly popular subjects for patio pots. They are attractive shrubs, with tiny bell-shaped flowers that develop into a surprisingly good crop of luscious blueberries. These aromatic and delicious fruits are useful, even in small numbers to liven up a yogurt or your breakfast cereal. Grow them in ericaceous John Innes compost, keep them watered and in an open sunny position and they will reward with fruit and fabulous autumn colour. Now if I was looking for a fruit to team up with a few blueberries I would choose a nice ripe peach or nectarine. I love both, especially when I can pick sun-warmed fruit straight from the tree. They are normally most successful in gardens when grown against a sunny south or west-facing wall; that is unless you grow one of the fabulous dwarf patio varieties. 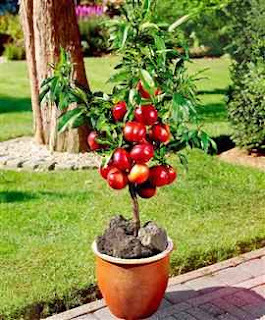 These make exquisite compact miniature standard trees with divine blossom in spring and succulent fruits in summer. Now that’s a productive plant I don’t mind looking at! 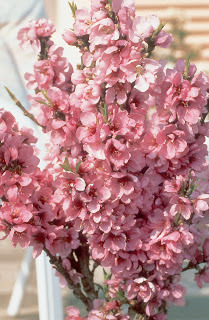 The two I would recommend are: Peach “Terrace Diamond”, with single pink flowers, followed by white flesh fruits. It is self fertile and the fruits ripen in mid August. 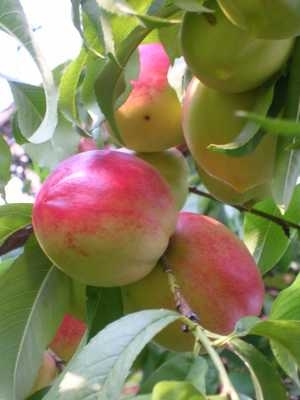 And Nectarine “Garden Beauty”, with double pink flowers, followed by yellow flesh fruits. It is self fertile and ripens in late August and September. Both are ideally suited to large pots (45cm diameter or more) filled with John Innes No.3 compost. They will require annual feeding with either Vitax Q4 professional compost or rose fertiliser. In early spring scrape off the surface of the compost, add a handful of fertiliser and top up with more John Innes. 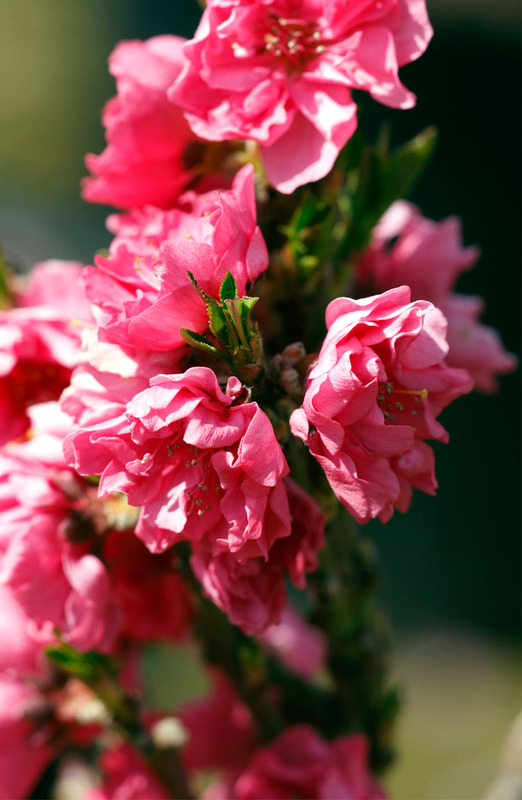 The delicate blossoms can be susceptible to frost, because they flower so early in spring. So put your peach or nectarine in a sunny, sheltered situation, or protect with horticultural fleece. Because they are dwarf and compact they are easy to cover with a horticultural fleece jacket. So what do I hate about peaches and nectarines? Leaf curl! That’s the fungal disease that causes those red blisters and disfiguration which ruins the otherwise attractive foliage. The problem is the fungal pathogen, Venturia inequalis, the spores of which are spread in rainfall in late winter and early spring. Here’s the clever bit. If you put an umbrella over the plant from late December through to March you won’t get leaf curl. If you have a large tree, or even a peach trained on a wall, that can be tricky. But with one of these patio peaches or nectarines an old golfing brolly will do the trick. Healthy foliage, beautiful flowers and delicious juicy fruit straight from the tree; what more could one ask for? Maybe one as a Christmas present…………………..